Love the idea of minimalism but think it's too extreme? Designing a clean and serene work space can inspire and increase productivity. Minimalism is all about being thoughtful with your space so that you can maximize the joy you have when you are in a room. When your work space is comfortable and inviting, it makes working seem less tedious and more enjoyable. Minimalist designs can help to reduce stress and lead to healthier life in the future. 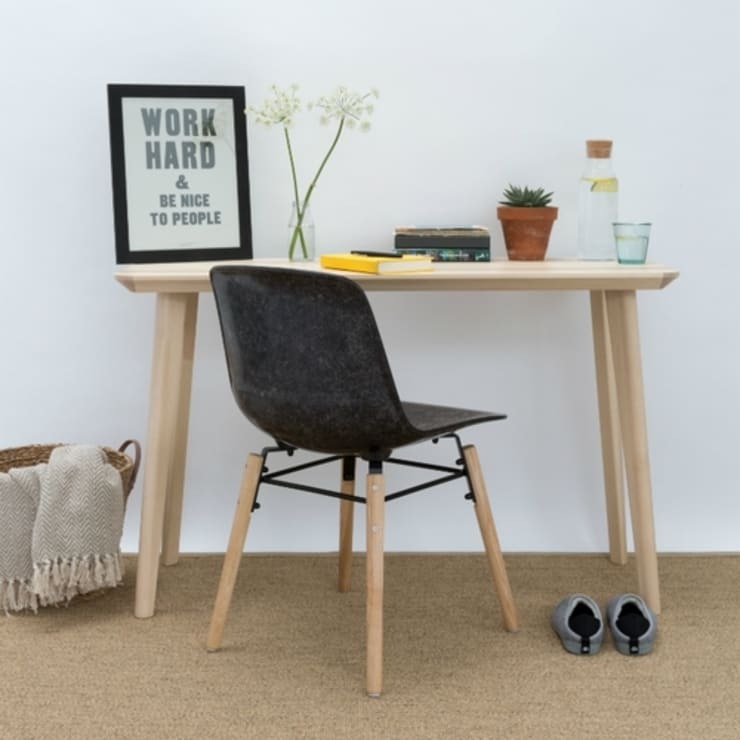 Here are 8 ways to bring minimalism into your work space while keeping it cozy and inviting. An uncluttered desk is beautiful. Keep only a few treasured items around as you work to cut down on distractions. For an effortless look, use plants and books to liven up a minimalist desk. Clear spaces are more appealing for everyone whether they use the work space or not! Create a mini-gallery wall by your work space to add charm. You can even have a rotation of prints or posters to keep it fresh. Be playful with the arrangement, you don't have to have all the prints lined up. Mixing it up keeps the look less severe. 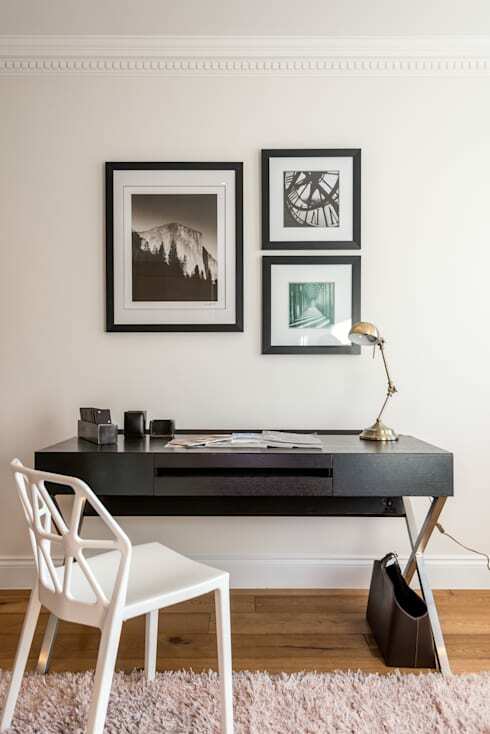 Use matching frames to create a uniform minimalist look or use a mix of frames to be more eclectic and cozy. If an all white and black colour palette is unpalatable, using natural neutrals or wood panelling is an excellent alternative. Keep the area bright and open for a minimalist look. Use faux furs, plants, and natural fabrics like linen to keep the theme. Intelligently designed modular storage solutions are great because they both hide and showcase belongings. It's also good intermediary step between slovenly and tidy. Fill shelves with books, plants, and art prints to bring more personality into a room. Cabinets and drawers can be used to tuck away office supplies that you need but don't necessarily want on your desk. A stand alone work space with pretty wall paper is very inviting. 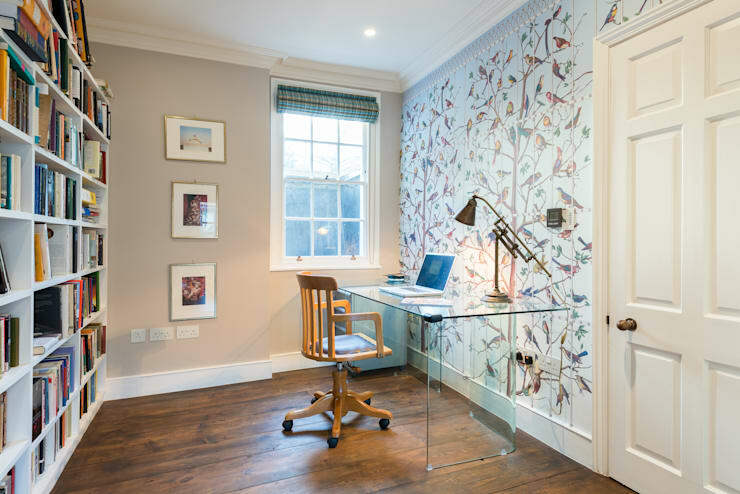 Wallpaper is a good solution for a smaller home office because it adds depth to a space. 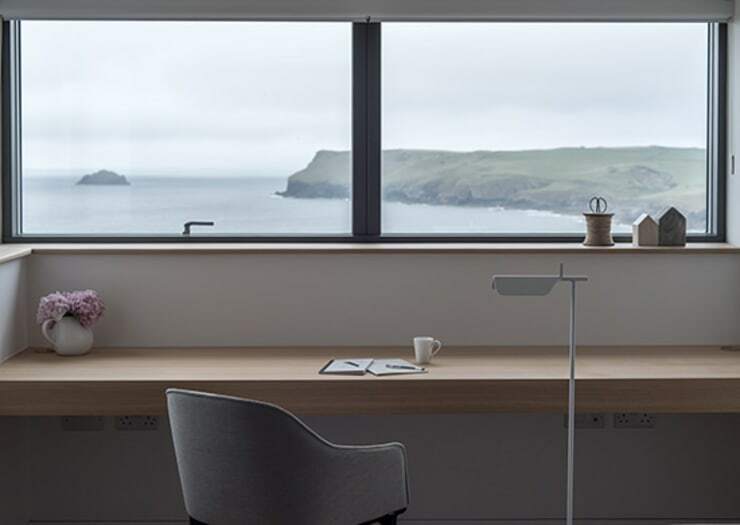 Couple with a glass desk to show off the wall that can double as art. 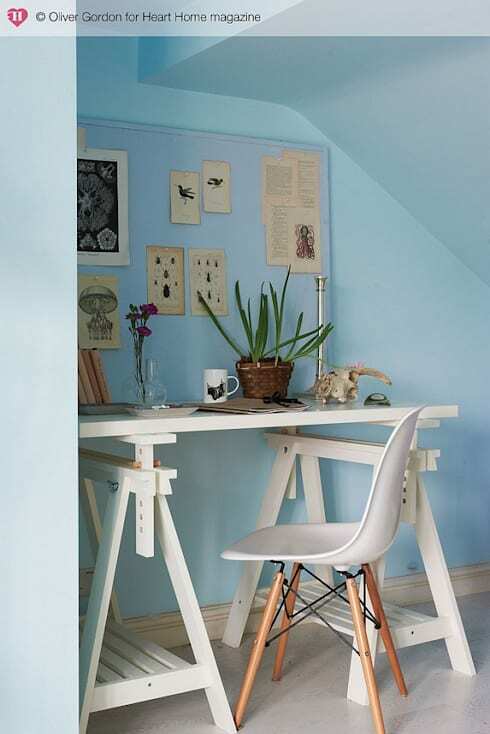 Choosing a dainty print lightens up an at home work space. For a more modern and minimalist feel, choose a bolder design. Make room in your design for comforts. Bringing in throw blankets and slippers help you to relax and feel at home in your home office. Don't make it so cozy that you never want to leave! Have just enough to make you feel comfortable and get rid of the rest. 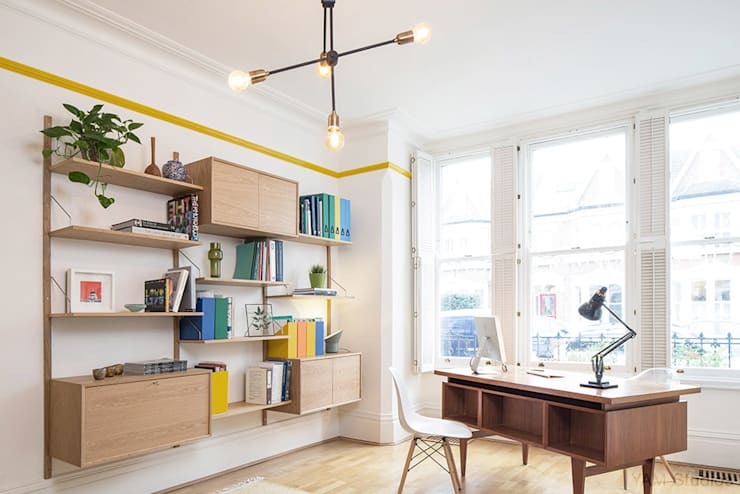 If you can't devote an entire room to a home office it's easy to take up a corner of a room to create a work space. Using light colours and minimal furniture helps keep the space open. Curate with carefully chosen and cherished objects to bring lots of personality into a workspace. Use a cork board to organize prints, lists, and notes. Multipurpose furniture is a brilliant minimalist method to use in your home. If you have a small living space this can help you downsize elegantly and keep clutter to a minimum. 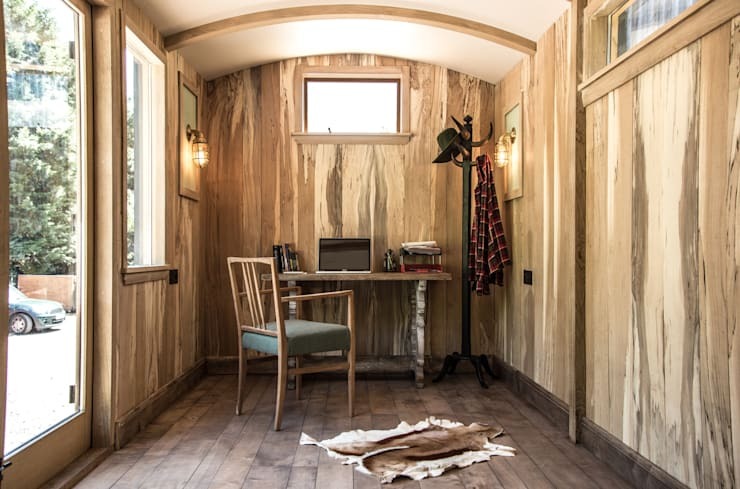 The non-desk workspace is versatile and chic. It helps keep things as simple as possible. How do you use minimalism in your home and work space? Leave your comments below to let us know how you stay cozy.